Ok, whole real time thing is crazy but it brought to search general awareness of time. If you track what had happened in last minute then tracking what happened yesterday is suddenly easy. 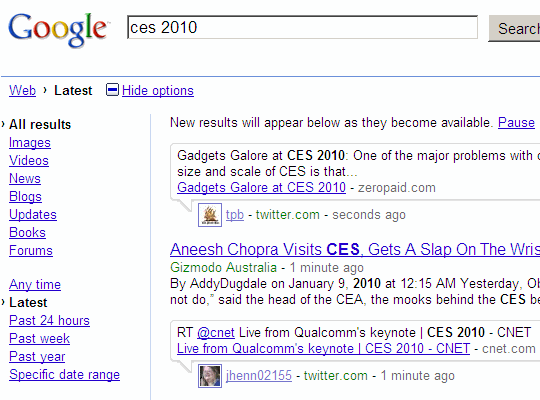 Google had been quietly adding extra options to refine searches and one of major additions (as for me) is time frames. As usual availability may depend on what version of Google you use. For generic English version there is Show options link in breadcrumb between header and result on search page. It opens sidebar with currently available refinement options. This mode only shows results from microblogging-like sites, mostly Twitter and FriendFeed. By default most recent results are displayed and auto-updated without need to refresh page. Results use special style and include author’s avatars and relative time (how long ago). Very much like Updates, but includes regular sites as well. It still has relative times listed and some results use simpler and more compact styling – site name instead of usual cropped URL. Some also seem to get dedicated type markings like Blog or Press release but those seem to be rare for now. Inline Latest block can show up in regular Google results as well, if looking for hot topic. These are further away from real time and closer to generic search, but with result limited to some span of recent time. Even when sorted by date there will be less recent results, those seem to tick through separate system before getting into regular Google index. On other hand mode allows additional refinements to be applied on top of time frame. Is identical to previous, except that you can use any two dates and narrow results down to any custom time span. Gives you visual overview of search results volume over longer time spans. Allows to narrow down results to specific month of specific year and uses custom result’s format with focus on date. It may have started with real-time craze but Google did sure nice work with refinement options and past lab projects like Timeline included in production interface. It makes search process less about Google-knows-better results and more about precise control and informative results formats. Remind me – what is so hip about real time? As you say Google surely did nice work here. New search options definitely improve quality of our search and enable us to find exactly what we want.